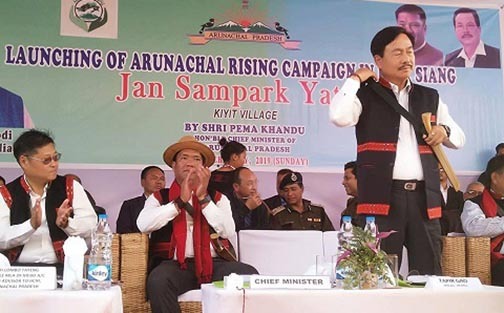 Gao, who addressed a mammoth gathering at Kiyit village of Mebo in East Siang district on the occasion of launching ‘Arunachal Rising campaign’ on Sunday, announced that the central BJP leadership has already opted for Pema Khandu as the next CM’s candidate. Gao also informed that he would be the face of the party in the parliamentary elections from Eastern Arunachal. Reacting to the Opposition terming BJP as ‘communal’ and ‘Hinduism-based political party’, Gao cleared that his party respects people of all religions and looks every community with same status. The BJP state president earlier declared that his party would not go for any pre-poll alliance with other parties for the next Assembly elections slated in April this year. He also urged the state and district level party leaders to make the rural people aware on the various developmental efforts initiated by the Central government with Chief Minister’s flagship schemes implemented in Arunachal. The campaign conducted under its Jan Sampark Yatra programme is to make the rural people aware on various flagship programmes initiated by Central and state governments. Arunachal Chief Minister Pema Khandu, who launched Arunachal Rising Campaign at Mebo in East Siang district on the occasion, claimed that his government has brought in a new trend of development to the frontier state during last two years. Khandu said his government is decentralizing the planning processes in a phase wise manner while it accepts feedback from various community organisations in preparing the state’s financial budget. “The DCs are given power to constitute committee to prepare need-based schemes observing the challenges and opportunities of their area,” said Chief Minister Khandu while adding that governing the state with various tribal groups with diversified cultures and religious practices is a very tough task.